Sitting fixed and focused at his desk, leaning forward in his chair with an assured disposition as the noise of gym construction resounds outside his office's walls, UCF head basketball coach Johnny Dawkins works fervently to build a winning program and a team laced with his hard-working DNA. Dawkins grew up in Washington, D.C., with a family whose work ethic and drive was woven into how he approached the books and the hardwood. As Dawkins began taking to basketball, he looked up to Hall of Fame player New York Knicks guard Walt “Clyde” Frazier for his tenacious style of defense. Simply watching great NBA players play the game, though, wasn’t going to gain him respect on the D.C. courts. One of the first people to witness his drive and determination was his former Duke teammate and current ESPN basketball analyst Jay Bilas. As an 18-year-old Duke freshman, Bilas made a pit stop in Maryland on his way back to Durham, North Carolina, to meet Dawkins, who was an incoming Duke Basketball recruit. But once the two of them reached the playground, to play basketball, Bilas witnessed Dawkins go from Clark Kent to Superman on the court. Heading into Duke, Dawkins embraced the chip he placed on his shoulder, making sure he outworked everyone else in the gym even though he was a McDonald’s High School All-American. If anyone understood the importance of never becoming complacent with success, it was Dawkins. When Dawkins made it to Durham, Bilas knew who the best player on the floor was. Following a disappointing 11-17 record as a freshman, Dawkins helped to lead the Blue Devils to a 84-21 record over the next three seasons, including three NCAA Tournament appearances and a near national championship his senior year, coming up short versus Louisville. He finished as Duke’s all-time leading scorer by 1986, which he held until J.J. Redick came on the scene some 20 years later. By then, Dawkins was was on the Duke coaching staff, where he worked under head coach Mike Krzyzewski, or Coach K, one of the great college basketball coaches of all time. Dawkins would go on to serve as head coach at Stanford before accepting the head coaching position at UCF. He replaced former coach Donnie Jones, who worked with the Knights for six seasons before being dismissed this past March. 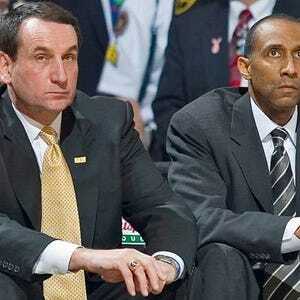 “I think from the very beginning when I coached him I knew he was smart,” Krzyzewski said. “Not only that, but he loved the game, and he wasn’t a one-positional player. He was a great player, not a good one. He wanted to get better off the court, and in his preparation, he wanted to get better on the court. Known for more than his coaching skills, Dawkins holds a high standard of character. A “stud” in every aspect of his life, Dawkins’ focus on student-athlete’s character is one of his greatest strengths. “The X and O stuff is important, but that other stuff, just as a parent you're like, ‘Holy cow, how lucky am I?’” Bilas said. This week, youth basketball players grades one through 12 filled the CFE Arena to work on myriad basketball skills in Dawkins’ first basketball camp as head coach. One of Dawkins’ primary goals is to build the character traits that will extend beyond just basketball. Sitting on a table in Dawkins’ office is a poster that reads, “Work hard, play harder.” When Dawkins was hired in March, he said his first order of business for the team was to gain an identity. Little did they know that UCF’s identity arrived in the form of a thin-framed, soft-spoken man hailing all the way from Washington, D.C.